My name is Vicente and I was born in 1971. 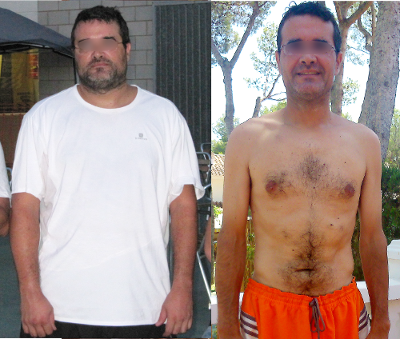 On May 2013 my body weight was 94 Kg (207 pounds) and on July 2014 it was 70 Kg (154 pounds). I’ve been able to keep my weight stable since then, without counting calories and doing just my usual physical exercise. I have read a lot about nutrition. I have found very interesing scientific articles, web sites and videos and my purpose is to write about this stuff in my blog. I will not try to sell anything to you. I am just sharing my points of view. I am an engineer, not a medical doctor and this blog is not intended to replace the services of a health professional. In no case the information that appears in this blog should be taken as medical/nutritional advice. Nothing that is published here should be used to diagnose or to treat any disease or health condition. You should consult your doctor before taking any food/product/drug or using in any way the information in this blog. Hola 👋! He descubierto este blog gracias a Centinel! Me gustaría tener días y días para leerte! Soy una friki de la nutrición 🍏 estudiando dietética. Ojalá mis profesores enseñaran verdades como las tuyas. Felicidades y gracias por todo lo que aportas. No sé si serán verdades o no. Como mínimo son las cosas tal cual las veo cuando las cuento, tratando de engañarme a mí mismo lo menos posible. Pero hay que tener cuidado con lo que cuento: yo he estado años con problemas de peso y de salud, y no era capaz de perder peso y mantenerlo. Siempre recuperaba el peso. Tuve la fortuna de encontrar las dietas LCHF y pasados casi dos años estoy mejor que nunca. Esa experiencia personal me condiciona y aumenta el riesgo de que malinterprete la realidad en un sentido concreto. Lo mejor es siempre acudir directamente a la literatura científica y con espíritu desconfiado. Sin intermediarios (ni siquiera los autores del artículo en cuestión). Espero que te guste lo que leas. I recently recovered an email you sent to me. I am impressed by your experience and your work! We must all fight against the destructive diet industry which causes so much damage. I have a new book out called NATURALLY THIN–Lasting Weight Loss without Dieting. It reflects the path you chose to lose weight and describes that path for others. I wish you the very best in sharing your story and bringing others along in the reality of permanent weight loss. Your work, however you began it, is important–valuable. Keep getting the message out! Just in case you didn’t see them, I wrote a couple of blog posts that included ideas from your last book.